Okay, so I’m having “holy cow” moments more often these days! I came across this fabulous sculpture while scanning new images from the Mint Museum of Art in Charlotte, NC. I never even realized such curvilinear shapes could be achieved with bamboo! What is fascinating is that work stems from the bamboo basket tradition in Japan. (I resisted the urge to use another exclamation point.) This reminds me of the work of the American artist Ed Rossbach who uses all sorts of materials to create vessels and baskets in an endless variety of techniques. Like Rossbach’s work, Ippo’s takes the basketry idiom way beyond utilitarian into sculpture-like pieces of art. Need I reiterate that this is not “craft” but fine art? Also, did you know that bamboo is a species of grass? Japan has over 600 species of bamboo. Its tensile strength has been compared to steel, and it can be made into just about anything. Bamboo is also edible. The three major species of bamboo in Japan are moso, hotchiku, and madake. Bamboo basketry goes all the way back to the Jomon period in Japan (c3000-200 BCE). Bamboo baskets served a variety of functions in daily life. The appreciation for the aesthetics of woven bamboo textures is evidenced as early as the Yayoi period (c200 BCE-200 CE). Some Yayoi pots were decorated with impressions of bamboo basket patterns. Over the centuries, the extraordinary craftsmanship and intricate patterns of bamboo basketry have made it a cherished part of such time-honored traditions as the tea ceremony and ikebana (flower arranging), both disciplines considered art forms by the Japanese. Some other uses for bamboo in Japan are archery bows, musical instruments such as shakuhachi (looks similar to a recorder) and flute, chopsticks, tea whisks, and a variety of utensils used in the tea ceremony, furniture, and pipes. In the past couple of decades, bamboo artists have taken the bamboo weaving tradition and extended it into the realm of sculpture. Torii Ippo was the son of a basket maker. He learned bamboo weaving technique by copying baskets his father had made. The seminal event in his maturing as a bamboo artist was his viewing in a 1959 exhibition of a bamboo flower basket from the imperial court dating to 757 CE. He attributes the power and grace of the piece – which had remained perfectly intact for over 1200 years – as the determining factor to his career as a bamboo artist. While he still creates baskets out of bamboo, many of his pieces such as Lighting God are stand alone sculptures. 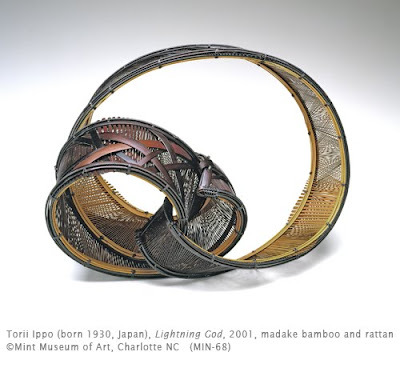 Most of Ippo’s works combine bamboo and rattan (the stem of a type of palm). View more works by Ippo in the Tai Gallery, New Mexico. Another work at the Museum of Arts and Design, New York (and just because it’s an awesome museum). See additional contemporary bamboo artists featured in the exhibit New Bamboo at the Japan Society Gallery in New York. The Mint Museum has a fabulous collection. Check it out.